When I made it, the Gävle Goat of 2013 was standing strong, but sadly (and delightfully) he was burned like so many others on December 20th. It happened during the Atlas Obscura office Christmas party, and though we had been checking the goat's live webcam all day, we sadly missed the moment of flame, catching him just after, a naked frame, surrounded by smoke and firefighters. The aftermath of poor Gävle Goat 2013. So deep does my love for the ill-fated goat run, he also showed up in a Curious Fact! 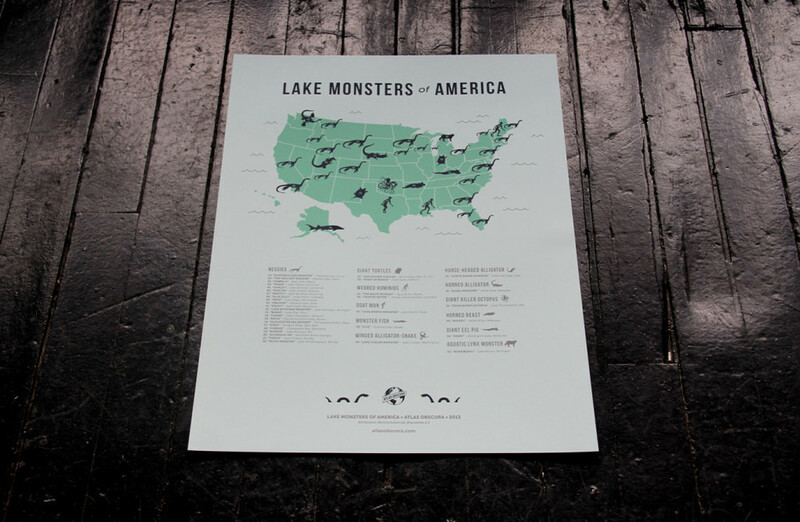 The Lake Monsters of American Map that I designed is live at Atlas Obscura, at last! The article also features some fantastical naturalist cryptid paintings by the husband. I've been creating a daily "Curious Fact" infographic over at Atlas Obscura for months now, and today marks the 200th fact! I can't believe I've made 200 of these. To celebrate this nice round number of facts, we launched a new page where you can see the whole collection in one go. Take a look at my 200 (and counting) little labors of love! (You can now share the fact of the day, which is located near the footer of Atlas Obscura.) And here is a short article about what goes into making them. And yes, I did design myself into the 200th Curious Fact. I realize how self-indulgent that seems, but I'm always so willing to pose for me! I've spent the past few months working on design for the new Atlas Obscura site, to be launched in early December. Though the site is going to be beautiful, a lot of the work I've been plugging away at is fairly uexciting, and not really worth sharing here. However, there is one portion that I am very proud of: Curious Facts. A new infographic about one of the Atlas's curious places will appear on the new site every day. Below is a sneak peak at a few of my favorites.